French director Anne Fontaine is known for her daring portraits of passionate women in films like “Coco Before Chanel” and “Gemma Bovary.” So the setting of her next film, “The Innocents,” may come as a bit of a surprise: at the height of the Second World War, an atheist French Red Cross doctor (Lou de Laâge) is called in secret to tend to a convent of Polish nuns. When she arrives, she discovers many of them are in advanced stages of pregnancy. The film is fictional, but based on a French doctor’s diaries. You lived in a convent for a while when you preparing to make the film. Why did you choose to do that? I went to retreats in Benedictine convents to feel, from the inside, closer to the women, the rituals. I knew that I would shoot in the convent with this story. I met this story through the diary of a French young doctor—the nephew of the doctor had the diary. When I decided to do this movie, I wanted to film from the inside the life of the community, all the different personalities: who is the Mother Superior? The novices? All the hierarchies? Of course, it's today—but it hasn't changed a lot. It helped me a lot to know how to film the faces, the gestures, the moments when they are in a group, the moments when they are doing things very casually. It was a very interesting experience, and I spoke with them about the movie, about this situation. It’s completely incredible to be a nun and to be pregnant and to give life when you are raped, and in these conditions. They all were very touched by the story and they told me their point of view from today. They said this situation is relevant in many countries where there are wars. Have you heard of stories that are similar since making the film? I did a screening [at the Vatican] three weeks ago. A bishop spoke after the screening and said that it's a terrific movie for the church, because this story was completely hidden. It was completely forgotten. The movie can touch Catholic, Jewish, Protestant—a person doesn't have to be Catholic, of course, to feel what happens. He said that today there are similar situations in Africa, in countries at war. So the response at the Vatican was good? Yes, they were very moved by the film. They said that it's a terrific movie for the church. It's still appropriate. You have to see the truth in front, not hide it. The film was pointing to something very unjust and disturbing, so I was struck by how beautiful is. It's beautiful to look at. Yes. It has to be beautiful to support and to tell the violence, the malheur, the despair—the beauty gives a home for the viewer underneath this tragedy, to make them more open at the end of the movie. I referenced paintings from [French painter] George de la Tour, and also really just pictures with the Virgin and the Child. There are many. We worked with my DP [Caroline Champetier] in a very precise way to be strong and beautiful and also very close to their faces, to feel what is behind the faces. To express the doubts, the way they recuperated—each one decidng to be a mother or not, or how they could be a mother after such a strong shock. The music is songs, Latin songs. The Polish actresses sing them directly. There is some music from Handel and also a little movie music. But not too much. When you are in a convent, the silence—the noise of the snow—the way you are constantly aware of the silence is very important. I didn't want to put too much music because it would be too conventional. I think you are more moved. I recognized a Max Richter track. Yes, at the end. I love that music and it fits perfectly. He's a brilliant composer. He has spirituality inside of his music, I think ... I asked him to do the music but the schedule couldn't fit, but he liked very much script, and for me he is one of the most interesting composers today. One of the film’s theme is doubt—people doubting their vocation. The nuns talk about it, and I also feel like Mathilde is thinking about her vocation as a doctor as well. It was very important to me to not to create an opposition between different ways to have faith. Mathilde (Lou de Laâge) is a pragmatic, scientific girl, a Communist [her parents were Communists]. She's very young, and she thinks that concrete action is what's important. When she's going to meet the situation at the convent, she of course is not prepared for what she sees. Nobody's prepared ... She has to understand after a while what is underneath the nuns’ shock: what is their life, what is their faith. She has to question herself about that. And that's interesting, because she's not like someone who can say, "Oh my God, now I am Christian." But she understand that as a physical question, in a way, for the first time in her life. And the novice, Maria (Agata Buzek), has transgress. She has to disobey, to present a lie and be concrete about it. Not to be only spiritual. This creates a strong relationship between these two women and between this young doctor and the community, because they have to work together, in a way. I was very interested by this young doctor that discovered what faith is about, the fragility of that fact that there is God in their lives, and it's cruel to be raped two times as a woman, and as a religious woman. I feel like filmmaking is both spiritual and material. It's messy and a lot of work. Do you think of your filmmaking as a vocation as well, in that way? To do a movie is to have a vocation. I decide to do a movie if I have faith in the movie and in the story. I can't begin if I don't have it. I am not Christian. I was educated as a Catholic; I have a father who is an organist; a mother who does the windows. In my youth I was in the church a lot because my parents were there. But I think that what is important is to have faith in something. That is the most important thing, and not to judge the other faiths. To be open. I think the movie speaks about that. For me, to be a director is to be in this mood—to be sure that this story is alive. We're going to give birth to the characters. We have to create the truth in the story. When it's on paper, when it's a script, it doesn't exist. You have to be sure that this woman is going to exist with all of her complexity. That's the reason the cast is so important: if you don't have the perfect interpreters, you'll miss the thing you are trying to catch. In each movie, it's another problem to solve. I was very lucky to have the best Polish actresses. They are really remarkable; they went into the characters so deeply. It was like real sisters. I couldn't imagine that they were actresses. The Mother Superior, Agata Kulesza, is very known in Poland. She's a star there. And Agata Buzek is a sort of Cate Blanchett, an icon of theatre. They have done incredible work. For me, it was also good to shoot faces, but not French faces that I know. It's a cast of almost all women. And there you are, a woman directing a cast of almost all women, which is still somewhat unusual in the world of film. And for the story, it was necessary! It was a story about women—but there is also the Jewish French doctor [Vincent Macaigne], who brings lightness and irony into the story. Thirty nuns, one French young doctor: it's their secret ... 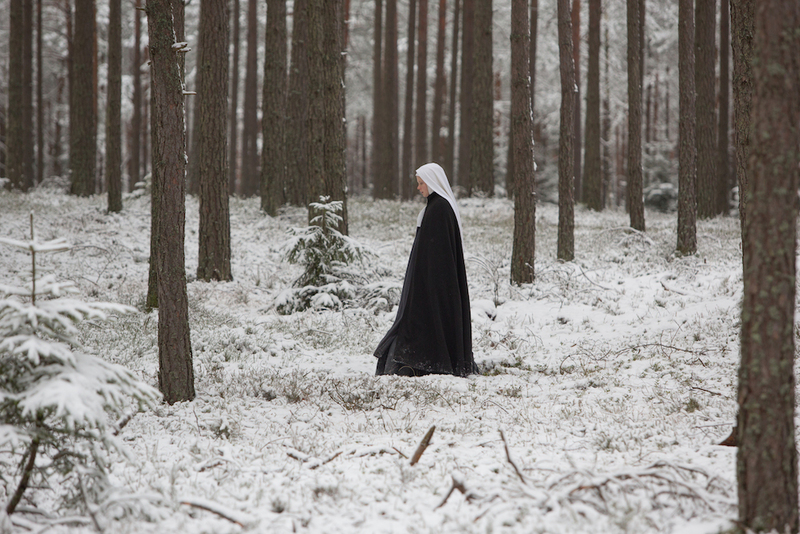 The movie is about positive transgression: the nun at the beginning decided to go through the forest to find some help. She hasn't told anyone, "Now I'm going to go out." It's a rule in this monastery at this moment, in 1945. It was tougher than today, I think. And it was unsafe outside the walls. It was in the middle of the forest, and they were afraid that if somebody knew, they would be killed. They will be shamed for life. The Mother Superior thinks that she's protecting them—in a bad way, but she thinks that she has to be completely closed. Exactly. It exists, it has existed, and it exists in other religions, of course. Were there any other films you were thinking about while you were making this one? I showed my DP three or four movies, very different ones. “Thérèse,” by Alain Cavalier, for the lights, for the simplicity of the way the faces are lighted. It's a very beautiful and moving movie. Also Bresson's “Angels of Sin.” And Jane Campion movies, for the Romanesque. I've seen “Ida,” more because the actress I had [Agata Kulesza] came from it. Another movie—very, very famous in France, I don't know if you know it here: “Des hommes et des dieux” (“Of Gods and Men”), a story about monks that are killed. I watched religious movies to see what I liked, what I didn't like. It's a mixture of many things when I prepare a movie. The documentary, yes. “Le grand silence.” I have seen it. It's not cinematographic, but it's the ritual: beautiful, because it's very simple, very natural. It makes you feel contemplative. Yes. I tried in my movie to be contemplative, but also dramatic. With attention to the inside. It's important to feel true in these moments, because you can fight against violence when you sing, when you pray. It's the way they fight against what happened.